I have many flowers that I absolutely love. I guess that's why I'm a gardener. But one of my favorites of all time has to be the Oriental Lily. Specifically, the Casablanca Lily just blows me away each and every season. The scent when I walk out my kitchen door is pure heaven. And the white flowers simply glow in the waning light of dusk. They are multiplying each year, and I couldn't be more delighted. I'm not sure what this gorgeous pink lily is, but it rivals the Casablanca for loveliness, that's for certain. I'm shocked that the deer didn't snack on them before they bloomed, but ever so grateful they kept away! Another much shorter white lily, of unknown variety. I don't care, I love them all. I think I may have to add some more lilies to the garden next spring. I'm pretty sure I can't get enough of them! 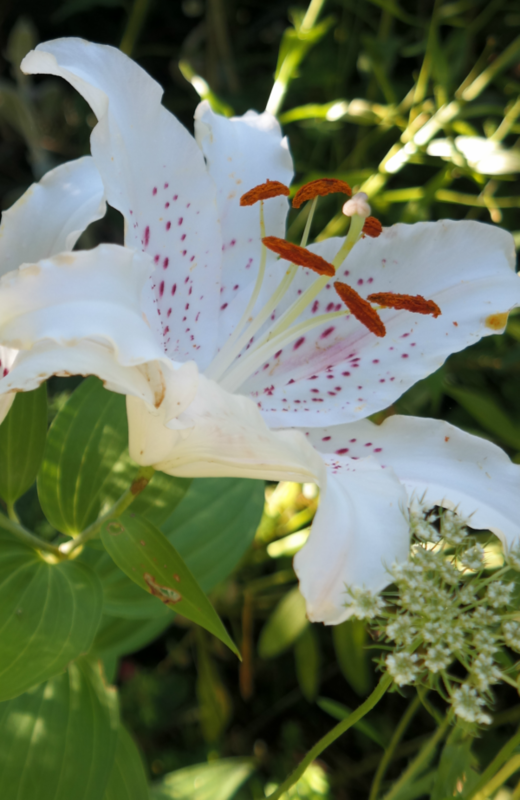 The only negative with lilies is if you get the pollen on your clothing it stains. That's ok, I'll take my chances. I was tempted to cut more to bring in the house, but I'd rather let them bloom. This one lily at the kitchen sink has perfumed the air inside my home with the most lovely fragrance. It certainly makes washing up after dinner that much more enjoyable! Do you have any lilies in your garden? What is your favorite variety? No lilies in my garden, but yours are outstanding. Wow, such color, enjoy them! Thanks, Kim! They are so gorgeous, I'm in love! They have eaten the tops of my lilies in the past....I think perhaps my resident deer have moved on as the dogs scare them! Those are just beautiful, such elegant flowers, aren't they? We have several varieties in our gardens and I don't know much about them, as they were here when we moved in. Oh, wow!--your sweetie went to Woodstock?--glad you enjoyed the post--I didn't go--too young, maybe you can get him to do a blog post about it, I would love to read it! So glad you stopped by and hope you come back often. I was too young also, but he still talks about it from time to time and still has his ticket stubs! Thanks so much, Laura! I'll be sad when they are done! 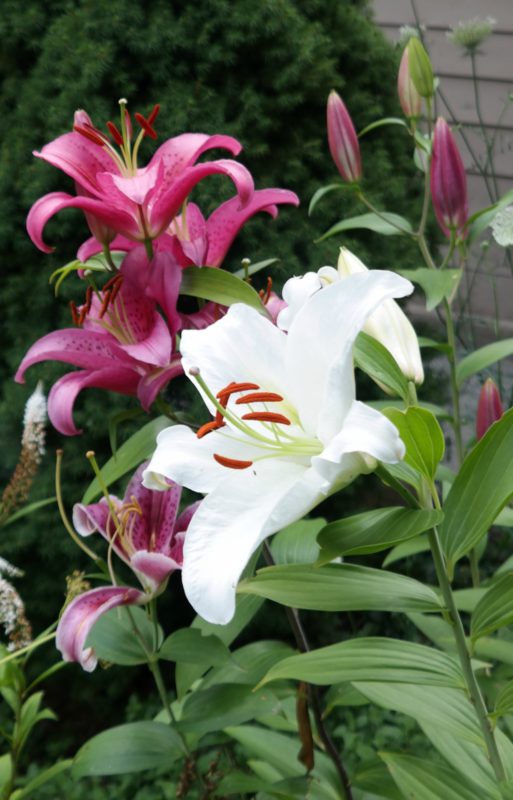 I love that white one, I have a lot of day lilies in yellows and purples. I am digging them up and moving them as I am tired of the colors. But I don't think I'd ever get tired of a Casablanca. I have a ton of yellow and orange daylilies also, Carole! I only have the Day Lilies. They are beautiful but have already bloomed and died. Your Oriental Lilies are outstanding!!! 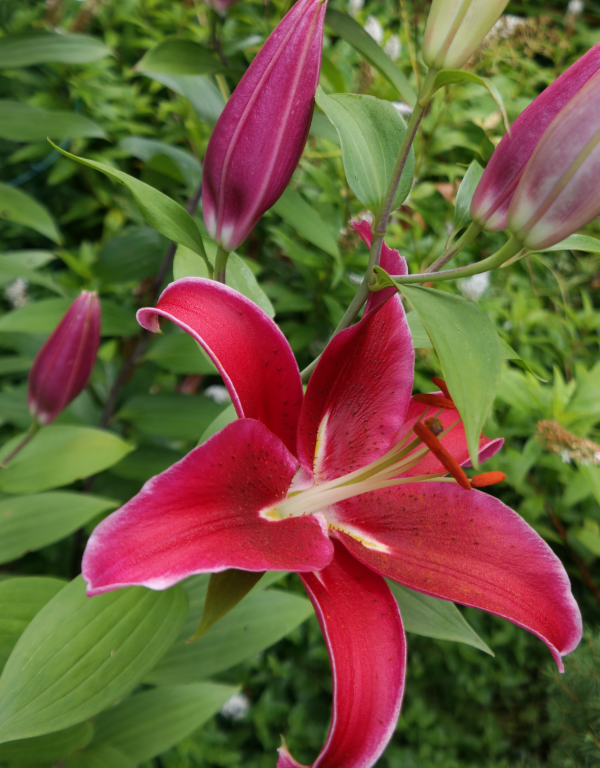 The flowers are at least 10 times the size of the daylily flowers, Lisa! They make quite the statement in the garden! I also only have day-lilies. Your lilies are just beautiful! I haven't had your luck with roses, Lorraine, but the lilies sure seem happy! Those are so gorgeous, Debbie, and I do know that intoxicating fragrance. 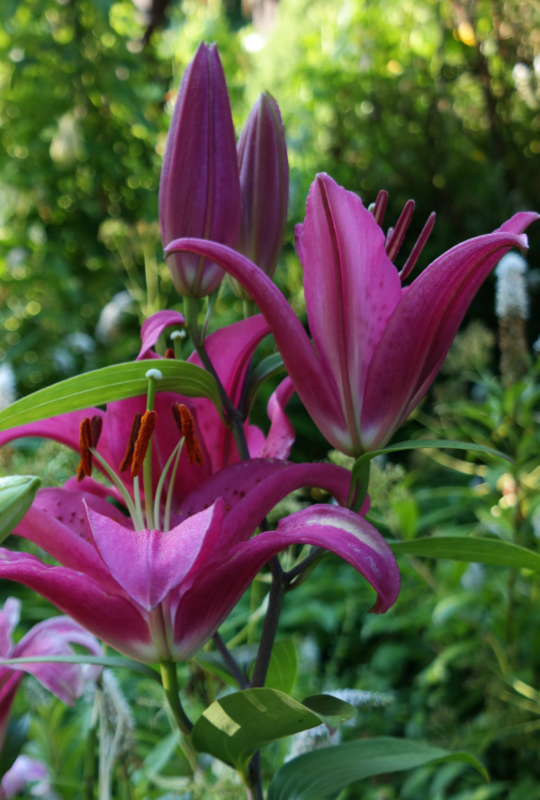 I once had Asiatic lilies, and they multiplied beautifully. Then, either bunnies or chipmunks at them all! I tried replanting once, and the little boogers kept taunting me, chomping them off at ground level, until they grew no more. 😢 Yours are lovely, enjoy! Oh that's too bad, Rita! I don't have any bunnies around my house, probably because of the dogs, but plenty of chipmunks! I love lilies too and I have a few in my garden. Not sure what variety they are but I don't care because they are just so pretty! So happy to hear that they multiply! They sure do, AnnMarie! I wish I could remember what that pink one is, I would order a few more! Oh yes, one of my top 5 flowers! Yours are magnificent, Debbie. You must be doing it right. One year at our old house I splurged on about 2 dozen from White Flower Farm and they were beautiful the first year. Almost none at all the second or succeeding years, but I don't blame WFF for that. I'm sure that we didn't have the right drainage for them and they got wet feet. We also had so much shade. Maybe we can try them again now that we live on a hill instead of in a valley and get lots of sunshine. Love the fragrance of the Casablanca! And you are so right about the importance of having something pretty to look at while doing dishes. And you have those gorgeous bottles when there's nothing in bloom. I bet the sunshine through them is lovely! I think I ordered these from White Flower Farm also, Dewena! 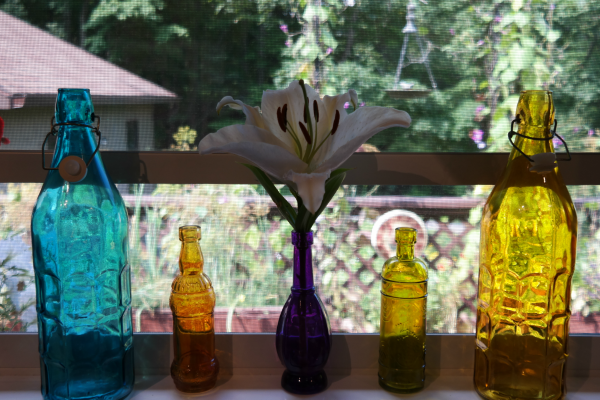 And yes, I love my colored bottles in the window! They will go away for a while when fall/holiday décor comes out, but they'll be back! All lovely and love the bottles in the window! Thanks, Bernideen! Do you have lilies in that gorgeous garden of yours? I love your lillies. I planted some this year, but the slugs ate them all as soon as the first leaves got out of the grund! Oh that's too bad, Magali! Here we have a product called Sluggo and Sluggo Plus which works amazingly well to get rid of those awful pests! It's organic, too, so I use it in my veggie garden. Your lilies are gorgeous! The only lilies I have growing here are tiger lilies. They're so pretty when they're in full bloom, but unfortunately, once they fade (like now), they look awful and scraggly. True, Melanie - my tiger lilies are done and at that scraggly phase also! Oh no, Rue! What have you tried this year? Hope it works!! We have those 'road lilies' also, Donna - tiger lilies. I love them!! I'd love the name of the lily you had that bloomed all summer, Nancy! How beautiful! 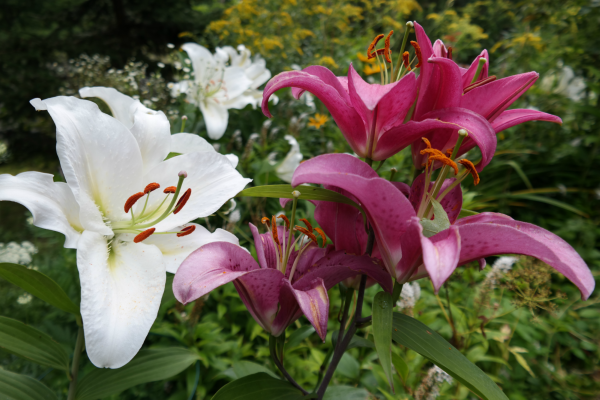 Now that I think about it, those heavily scented lilies are not that common here in the summer. Maybe they need the weather to be a bit cooler? Or maybe I just haven't been looking closely enough! Yours definitely make me want to investigate this a little more. I have grown several varieties of daylilies but they are not very scented. Hmmmm, Stacey, I can't answer that one, but check out White Flower Farm and look up the Casablanca lilies and see if they are good for your zone - you won't be disappointed!! I love lillies too. :) So pretty. I was surprised that not all of them have the intoxicating perfume though. It's the same with roses, Debbie. When I'm ordering roses I always look for repeat bloom, cold hardiness, and FRAGRANCE!!!!!!!!! I'm big on scents. Candles, aroma diffusers, plug ins, you name it, I've got it! I'm sure it doesn't help my allergies but I don't even care! Thank you, thank you for this post. I absolutely adore lilies, but have never grown them. I really need to do some gardening in my current house. I've been here five years, but the first three I was taking care of my husband, and then after he passed away, gardening was the last thing I thought about. But I'm emerging and need to grow some beauty. It's a healthy way to get some exercise, Pattie. And gardening is good for the soul!